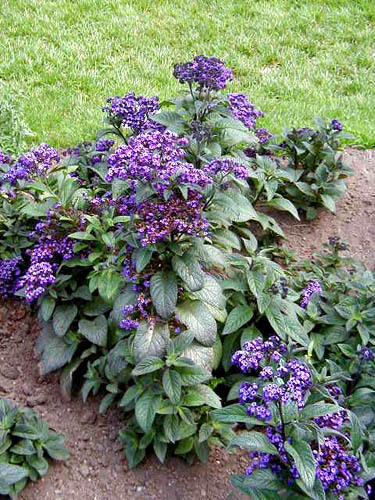 Bring old fashioned romance to your garden with this bushy annual bearing clusters of tiny, strongly perfumed purple, blue or white flowers. Performs best when shaded from hot afternoon sun. indoors as a houseplant - Bring plants indoors in late summer as potted specimens or cuttings. Grow indoors in a sunny location, keep moist, and provide cool (50 to 55�F) nights. The tiny, delicate flowers are borne in dense clusters. The leaves are a very deep green with a purple cast. fragrant - The flowers are reknowned for their delicate vanilla-like fragrance. Propagate by seed, cuttings - Start seeds indoors 10 to 12 weeks before the last spring frost. Pinch the young plants to make them bushier. Plant outdoors when frost danger has passed and soil has warmed to at least 60�F. Take cuttings in late summer for overwintering indoors. 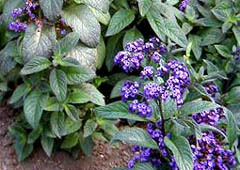 Cuttings result in stronger plants than seed, and are also more reliable for color and fragrance. Keep the soil moist but not soggy. Do not let potted plants dry out thoroughly. Fertilize monthly. Deadhead to prolong flowering. �Marine�: compact, 14� tall plants with deep purple flowers. �Fragrant Blue�: remarkably scented deep blue flowers which darken in color with cooler weather.